"I completely agree with you, but can't say so publicly because I depend on work from the BBC" is a message I am receiving with increasing frequency. And the confidential messages are coming from some surprisingly high profile personalities. Monday's post about the knighthood for former BBC Radio 3 controller and Proms director Nicholas Kenyon generated a record number of private messages of support. As well as dismay over the knighthood for the creator of BBC Radio 2.5 there was also widespread outrage that there was no similar award for one of the greatest ever champions of British music. 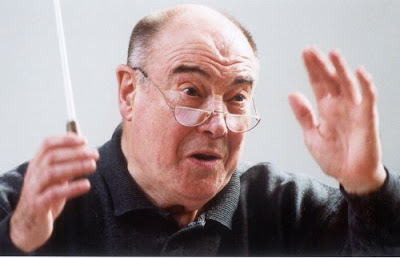 Vernon (Tod) Handley was born in 1930, and has probably recorded more British music than any conductor, living or dead. He is an acclaimed interpreter of Elgar, Bax, Vaughan Williams, Finzi, and many other composers. I can remember a Gerontius with his Guildford orchestra and choir in 1976 that was as good as any I have ever heard. But Tod isn't just a specialist in the English pastoralists. His cycle of the Robert Simpson symphonies (except No 11) for Hyperion is one of the great achievements of the gramophone. He has recorded Elizabeth Maconchy, and his cycle of the Malcolm Arnold symphonies for Conifer (now re-issued on Decca) is another great recording landmark. Despite these achievements, and despite a proliferation of musical knights, Tod Handley was only given the lower honour of a CBE in 2004, an award usually made to businessmen and local government officials. But is it really surprising? Robert Simpson's music was famously black-listed by the BBC. And under Sir Nicholas Kenyon there have been no BBC Proms performances of Arnold's symphonies for more than a decade, since the Second in 1994 in fact. And, quite scandalously, the acclaimed Ninth has never been performed at the Proms. Great music music making doesn't need surtitles. But Tod Handley should receive the award he so richly deserves. Not surprisingly I didn't get a Christmas card from the BBC this year. But one of their orchestras still loves me. And it is the right one. Now read about another forgotten maestro. Tonight BBC Radio 2.5 brings us a repeat of a Prom featuring Shostkovich's Fifth Symphony. It must be at least three days since they last broadcast that. But the overriding impression was one of circumspection. It grew stronger in an oddly detached account of Shostakovich's Fifth Symphony - Edward Seckerson in The Telegraph. What would we do without you?! It is an utter disgrace that Tod's incredible lifetime of achievement as one of the UK's great conductors hasn't been formally acknowledged with a Knighthood yet.